Market disruptor. The all new Huawei P series is now available in SA. This was precipitated by the latest offering by Huawei P20 and Huawei P20 Pro, respectively in the country. The launch in Johannesburg on Thursday night by the company, follows hot in the heels the unveiling of Samsung devices that all speak one language: camera. 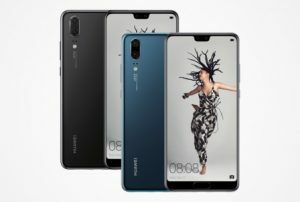 “The all-new Huawei P20 Series is a huge leap forward from the previous generation, blending technology and art to bring consumers an unprecedented experience. From the artistic design, gradient colours and Leica triple camera, to the Kirin 970 chipset and Master AI photography features, Huawei demonstrates its accumulated knowledge in photography innovation, and its commitment to intelligent technology research and development,” says Akhram Mohamed, Product Marketing Director Huawei Consumer Business Group South Africa. During their image recognition test, Kirin 970 processed 2,000 images per minute. In addition, the chip’s machine learning capabilities means that it has the potential to further improve its performance with extended use. To augment their justification, Huawei handed over four ‘ambassadors’ the latest P20 series to capture appealing images throughout the country as part of their assignment. Yes, I must agree the images were all top class, with my colleague murmuring ‘arg -they used still cameras’ in disappointment. Asked who the target market was Mohamed said their LSM was open to every working class citizen; who seeks to make a statement and also enjoys taking sentimental pictures. The Huawei P20 series features stylish aesthetic and comes in exclusive colours Twilight, Black and Midnight Blue. Each colour reflects a gradual change of hue. All the Huawei P20 series are available in South Africa from 6 April. Up-beat. 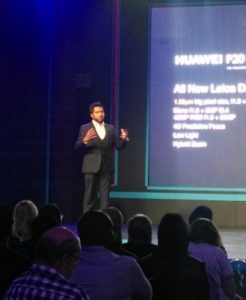 Akhram Mohamed, Product Marketing Director Huawei Consumer Business Group South Africa, addressing packed guests at the Galleria Auditorium, during the Huawei P series launch. The P20 and P20 Pro both come with an exceptional service offering, where customers will be entitled to a one-hour fast service repair at Huawei branded service centres, as well as a one-time free screen replacement service within the first year warrantee of the device. At the event, guests were encouraged to #SeeMooore and included an immersive AI reality experience from Huawei, a mini fashion show by designer Gavin Rajah, and musical performances by Lady Zamar and Timo ODV. Avashnee Moodley, communications manager at Huawei- pointed out that the CT Ajax football team, which the company sponsors would only attend the Cape Town launch, following a concern on the absence of the club’s representatives at the Johannesburg ceremony. By the time you read this piece, don’t be alarmed when you do come across a selfless body of yours’ truly, belly up as a result of a beating up by my colleagues for having warned them about their limited days as lensmen and lenswomen, stru! NB. South Africans will be able to see the intelligent performance of the Huawei P20 series in action in M-Net’s sixth season of Survivor South Africa: Phillipines from May 6.